Further Comments: Nicknamed Corky by visitors to the Court Oak, this phantom is said to smash bottles of cheap wine in the cellar. Corky is also said to manifest behind the counter, appearing in the form of a male in his sixties. Further Comments: A couple staying here reported a strange white mist in their room. One witness felt compelled to move towards the window. Two ghosts are said to haunt the inn, though who or what form the second one takes is unknown. Further Comments: Staff at this public house named their resident spook Grasper after a series of incidents where their bums were pinched by an unseen hand. Other activity is said to include chairs moving and footsteps heard in empty parts of the building. Further Comments: Caught on film by a group of party goers, this shade is one of the two ghosts that haunt the property, the other taking the form of an old woman. In 1993, when the pub was known as 'Baldie's Mansion', a masked white apparition was spotted, accompanied by nearby trees and bushes violently shaking. Further Comments: This pub appeared in the national press after a video was released showing a bottle of blackcurrant cordial moving unaided across the bar. The ghost has also been blamed for pinching female staff's bottoms and forcing one member of staff to quit after he spotted a female entity walk through a door. Further Comments: Murdered in the late nineteenth century, former landlord Henry Skinner is held accountable for throwing around small change and beer mats. A former landlord claimed to have encountered Henry. Two other phantoms, girls who fell to their deaths on a staircase are also reputed to haunt the site. Further Comments: John went mad with grief when he sound out his secret love had died in a coach accident - he shot his dog before turning the gun on himself. He has been heard moving around the building, and has been known to tap people on their shoulder. Further Comments: Locals say that this shade travels through the town, stopping at a couple of watering holes, before continuing on to the church. The phantom drifted silently passed a mother and child along Water Lane in 1922, heading towards the church. Both witnesses fled. Further Comments: A poltergeist at work within this pub enjoyed playing Tina Turner's Be Tender with Me Baby on the juke box, as well as throwing items around and moving ornaments. Further Comments: A former highwayman, Murph can sometimes be heard mumbling and moaning at the bar late at night. Further Comments: Several figures are thought to haunt this building, and although details are fleeting, they are thought to include priests and smugglers. Further Comments: Once a convent, one of its former inhabitants who drowned herself nearby would once come back to visit from beyond the grave. Further Comments: This phantom is said to grab female members of staff so hard it leaves red blemishes on the skin. Further Comments: The phantom Dorothy is still reported to drift down the road, heading towards the pub where she also haunts. Further Comments: An occupier of this property has reported the feeling of being watched and of doors closing themselves, although the presence is non threatening. Further Comments: The ghostly woman once reported here was said to be on the run from the police, and she drowned in a flooded stream nearby. A little girl was seen by a former landlady, who said the entity was dressed in blue and wearing a poke bonnet, and walked straight through a closed bedroom door. Further Comments: A woman in a grey dress stepped out in front of a car and was hit - the car then crashed off the road. However, the woman in grey had disappeared once the three people in the car climbed out. Two other witnesses reported that they too had seen the woman in front of the car. Further Comments: Doors would slam closed, and the landlord was once awoken by an oppressive atmosphere that flooded his bedroom. The pub is said to have been built on top of a graveyard, the haunting attributed by some to be carried out by phantom Cavaliers. Further Comments: Sharing a drink with the landlord after locking up, a witness looked across to the fireplace and smiled at an older lady, between 60 and 70 years of age, who sat there. She smiled and nodded back. The witness continued drinking for a minute before realising that all the doors were locked. Turning back to talk to the woman, she had vanished - all doors remained locked and a search of the pub found no one. Further Comments: A woman drinking at the public house found her hands covered in blood as she started to leave, though she had no wounds of her own, and no other source for the liquid could be discovered. More recently, the spirit of Geny, an eight year old girl, has be blamed for tugging at skirts, pinching people, and moving items around, while a phantom dog runs around chairs in the museum room. 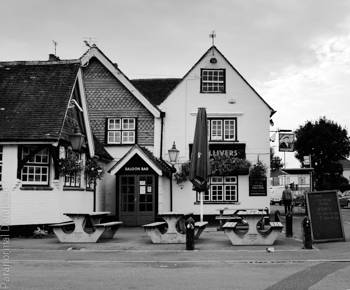 Further Comments: Echoing footfalls have been reported from this public house, as have strange sounds from the cellar. It has been speculated that the pub is haunted by a man hanged here after a mock trial went tragically wrong. Further Comments: When this public house was known as The Dolphin, one witness reported waking during the night to the sounds of clinking. Leaving their room to investigate further, they came across the apparition of a man perched on a chest, counting gold coins. More recently, mild poltergeist activity has been reported, including glasses and pool cues being thrown around, and footsteps heard in empty parts of the building. Further Comments: This pub is haunted by a phantom old woman who goes around silently cleaning. Further Comments: Old Fred is said to be a hooded priest, who once hid within the building. Bert is thought to be an old regular of the pub, and can be recognised by his red face and handlebar moustache.